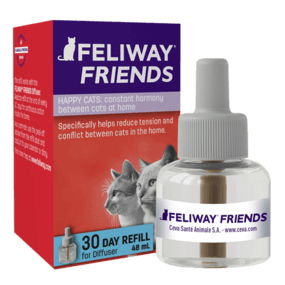 Use a FELIWAY FRIENDS Refill every month in order to continue to create harmony in your home and prevent tensions between your cats living together. Helps your cats get along better at home. Its continuous effect helps maintain constant harmony. Clinically proven and veterinary recommended. Just plug and play: screw the vial onto the diffuser unit and plug it into an electric socket. Leave the diffuser switched on continuously to help keep your cats in harmony. FELIWAY FRIENDS Refill requires a FELIWAY FRIENDS Diffuser. Refill should last 30 days (48 mL). Avoid plugging in the diffuser under shelves, behind doors, behind curtains or behind furniture, as it will not work. Don't forget to renew every month! Use the peel-off sticker on each FELIWAY FRIENDS Refill vial to remind you when to check and replace the vial. The one and only diffuser you should use with a FELIWAY FRIENDS Refill! Replace your diffuser every 6 months. 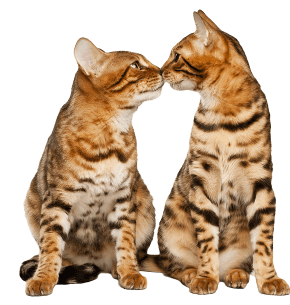 If conflicts cause other signs like spraying or scratching, FELIWAY CLASSIC can help.